Mullach Fraoch-choire and A' Chralaig form the head-wall of Coire na Cralaig which lies at the W end of Gleann na Ciche (SW of Glen Affric). 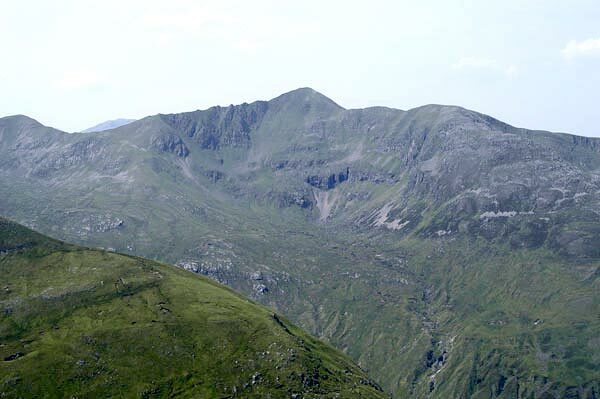 Mullach Fraoch-choire is linked to A'Chralaig to the S by a narrow twisting ridge. The summit ridge of Mullach Fraoch-choire is narrow and rocky with the crags mostly to the E, but the W slopes also have some crags and some stony slopes. 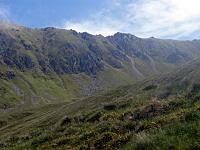 A descent is possible from the col linking to Stob Coire na Cralaig into Coire Odhar to reach An Caorann Mor below. The summit ridge continues NNW giving rise to a short NNE ridge, then a longer NE ridge. From the summit a further ridge splits to give NE and ENE ridges. Between the two NE ridges lies Fraoch-choire (heather corrie) for which the peak is named. Mullach Fraoch-choire viewed from Ciste Dhubh. Mullach Fraoch-choire from Stob Coire a Chralaig in June 2006. The ridge was tricky in places near the patch of snow. The Eastern aspect of Mullach Fraoch-choire from the Northern slopes of Sgurr nan Conbhairean (telephoto). 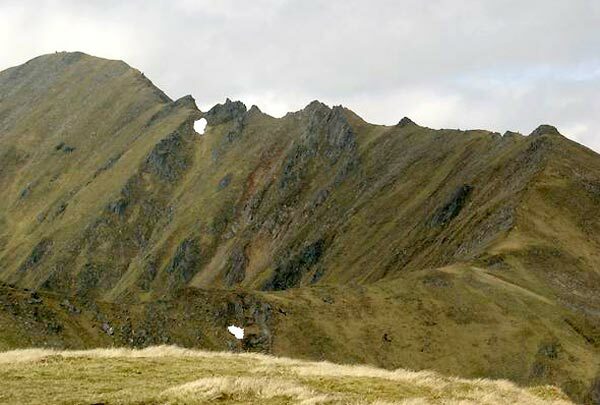 The summary information of one or more ascent routes that include Mullach Fraoch-choire. 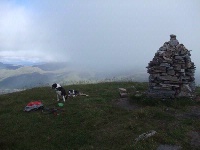 1 1154 m 13.28 km 5 hrs A' Chralaig and Mullach Fraoch-choire Moderate route with steep slopes and a good ridge walk. 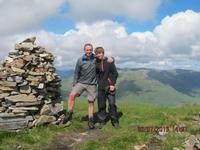 Me and Uncle Stevie at the top of Mullach Fraoch-Choire!! Mullach Fraoch Coire Summit. 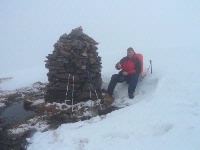 I came over the snow bank to my right to look Down on the cairn ! Post a few words about Mullach Fraoch-choire or read what others have had to say. 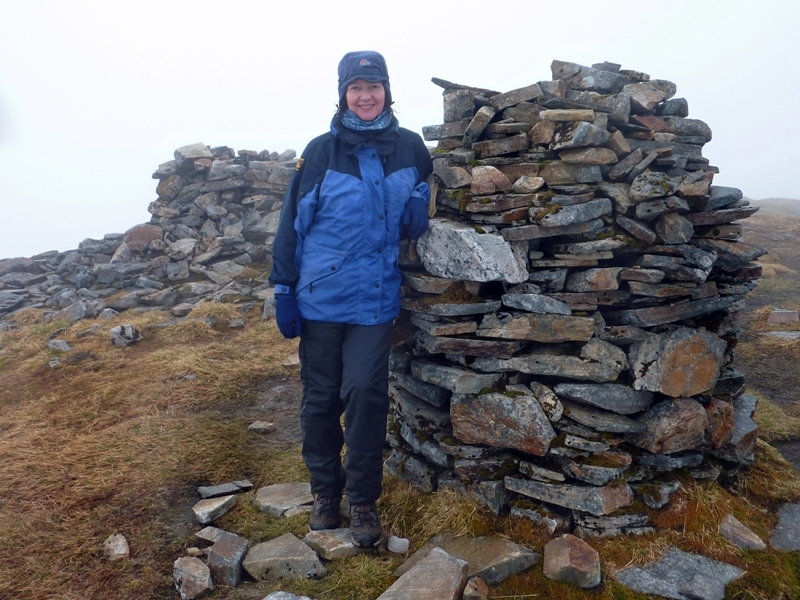 A good day climbing this one and it fellow Munro - A' Chralaig in sunny and showery weather. The ridge walk is spectacular but requires constant focus as their are steep drops on either side. Wet walk in for most of the way gives your boots a good test of their ability to keep your feet dry. The known ridge on this hill is very enjoyable and offers a nice airy ridge walk. The combination with near neighbour A'Chralaig makes for an easy half day's walk, starting with A'Chralaig before returning via Coire Odhair and the An Caorainn Mor. On a fine sunny day with Avalanche cat 2 snow on cornices and in gullys. 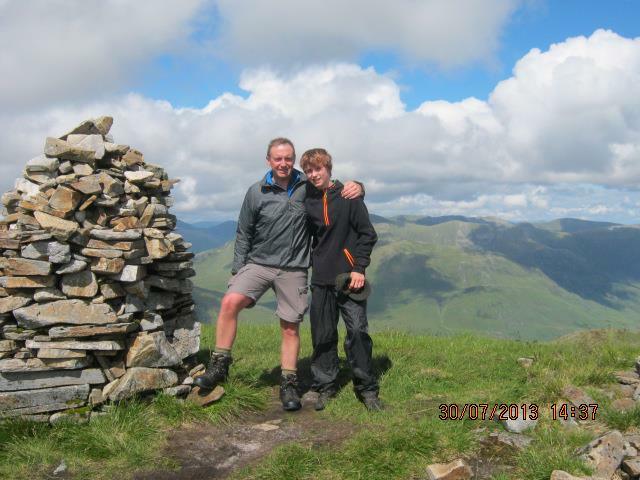 This is an excellent ridge walk one of the best Ive done so far. Anyone been digging snow holes in the corrie? It was ***** star accomodation thanks.